I can't wait to finish start the girls' mermaid inspired room. I truly enjoy decorating kid spaces more than I do grown up ones. There's less pressure, not as many rules, and using fun patterns and colors makes sense. For their room, I chose mermaid partly because of their obsession with "The Little Mermaid," and partly because both girls love the ocean. They often draw pictures of themselves with Joe or me at the beach- I love that it's their happy place and it makes this theme more personal. Plus there's the fact that I immediately had a vision of coral, mint, and fun 'adventure' touches like arrows, maps, and treasure (i.e. lots of 'gold'). Doesn't that sound fun?! The room has slowly been coming together in my head, but I wanted to put it together on paper. Sources (affiliate links included): Seashell Mobile. pineapple lamp. nightstand. fabric for headboard. Mermaid Pillow (discontinued but this one is cute.). Mermaid Sheet Set (similar). quilt (similar or this one which is perfect!). Vanity (similar). Decorative Mermaid. Art (Not to Scale): Resin letters. Decorative starfish. Hello Beautiful Girl framed art print. Printable Map. Gold heart. Arrow. Reupholster headboards- This is my first time reupholstering and it's taking me forever. I have one headboard partially done (you can see a peek of it in this post) but need to finish and start on the other. I can't wait to show them off. Paint Nightstand- I have two nightstands that I've had for years that I think will be perfect in the this room. I've painted one (pictured) so just one more to go. Paint Vanity- In the design board it's white but I have one that was handed down from my MIL that is just so cute! It's a honey oak color but would look great white or maybe coral. I don't want to go too crazy with color but coral could be a fun pop of color. 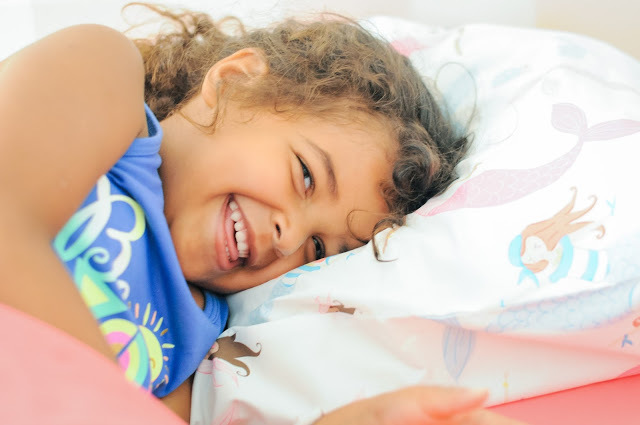 Get bedding- They have quilts (although this one is SO perfect and tempting me) and those fun mermaid pillows, but they need bed skirts and pillow shams. I haven't decided if I'll DIY the bed skirt or just buy a simple one like this one. These shams are perfect so I might just snag them while they're on sale. Paint the room. 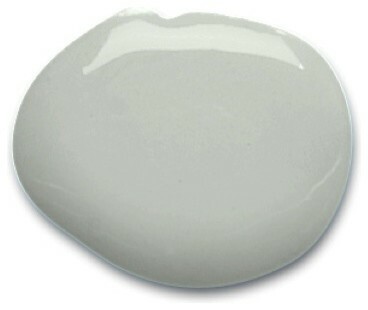 I'm thinking of Sherwin Williams Silver Strand. We painted the ceilings last weekend and I'd love to add wallpaper and trim (or maybe decals as a cheaper DIY option?). 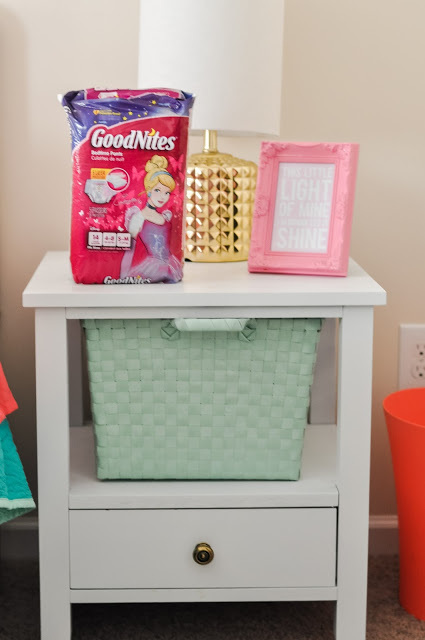 Eventually, I'd love to find a big dresser for the girls to share and to nestle it between two of these super cute and inexpensive bookshelves for a 'built-ins' look for less. Add art and accessories. I've collected a few things here and there- they have the gold heart pictured, some glittery N and G canvases, a metallic and white jewelry holder, and I might be able to recycle some things from their girly gallery wall from Genevieve's toddler room. But I'd love to add some fresh things too- arrows, a map, and some inspiration/scripture art. Find a rug. No idea on what direction I'll go here. I just want an attractive throw rug to cover up some of the boring shag carpet. Add Trim to curtains or DIY a pair. If you follow me on Instagram, you saw a peek of the peach-y pink curtains I snagged for $5/panel. Just can't beat it! But my original idea for draperies was more like this. I might end up leaving them be, adding trim, or attempting a DIY like in that previous link. Due to budget constraints I have to pace myself. There probably won't be a big room reveal any time soon but I'll be back with their finished headboards complete with pretty bedding when it's time. I'm calling that phase 1. In keeping with my 'progress not perfection' motto I talked about here, I'm excited for the finished outcome but am also enjoying the process. 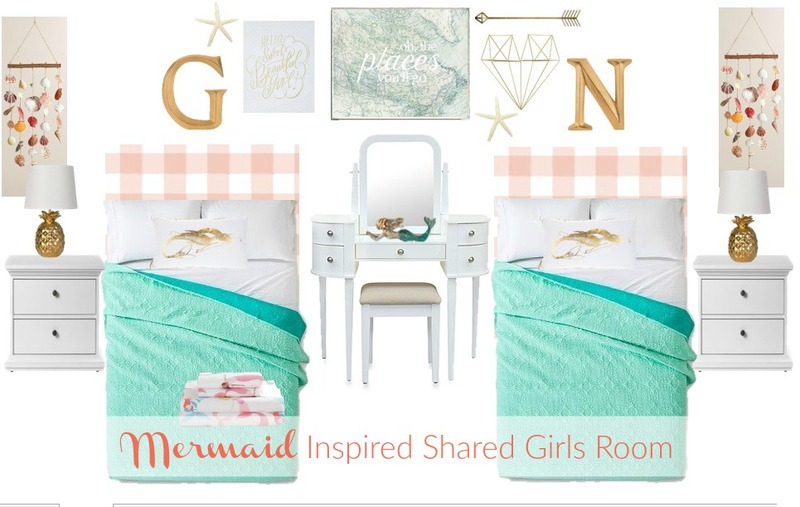 For more mermaid room inspiration, check out my Pinterest board and for more (lots more!) kids' decor ideas, check out this board. What are you working on? Do you have any room re-dos in the works?